This year we gave it some thought before we began. Should we really try again, given all the greens that bolted last year? The sparse potato bed? The prodigious, fruitless tomato plants? Yes, we decided. We can’t ignore the good dirt, the good sun, the summer air. I discovered that the leak in the spigot next to the garden was worse than the year before, but no matter. The seeds were sprouting up, growing. We harvested mizuna, spinach, peas and a few beets. Every year this happens. Our early yield is easy to eat. The garden is manageable, accessible. I enjoy piddling in the dirt. But then summer arrives and begins its long, fecund climb. I start to lose focus, not recognizing that this is when the systems necessary for growing, for maintaining and for preserving need to kick in. Without them, the yield, pests and problems are overwhelming. At some point we disappear and the vegetables grow out of control or shrivel from neglect. Last weekend I dug out the remains, erasing, at least for passers-by, the evidence of another inadequate growing season. 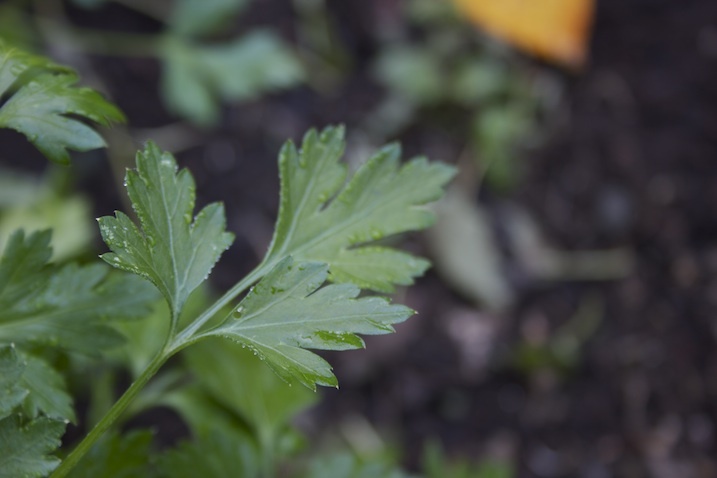 But next to the dried up peas, lost in the masses of fading Nigella Hispanica and Cosmos, was a patch of parsley. I’d given up on it in early September when it appeared to be overrun with black aphids. But now! 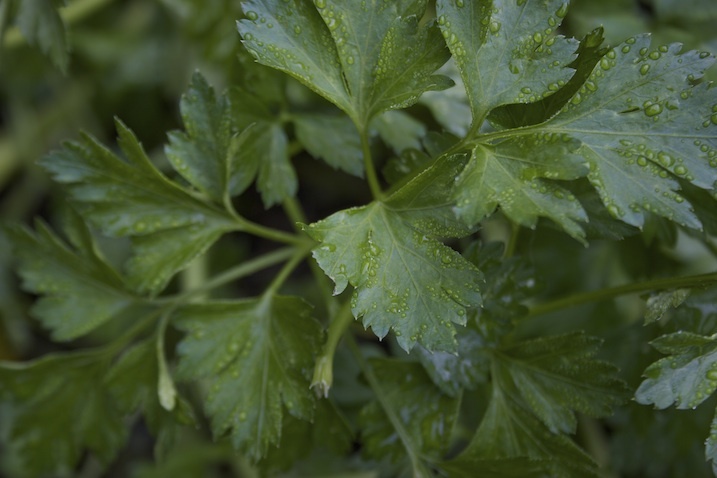 Is parsley supposed to taste like this? Is it supposed to be sweet enough that I retain the stems to eat them alone? This is what keeps me coming back. One success, even one that is due solely to good fortune, is enough to make me say what if every spring. I’m a better champion than I am a producer. I troll for the good stuff around this time of year, even if I can’t grow (or forage) it myself. 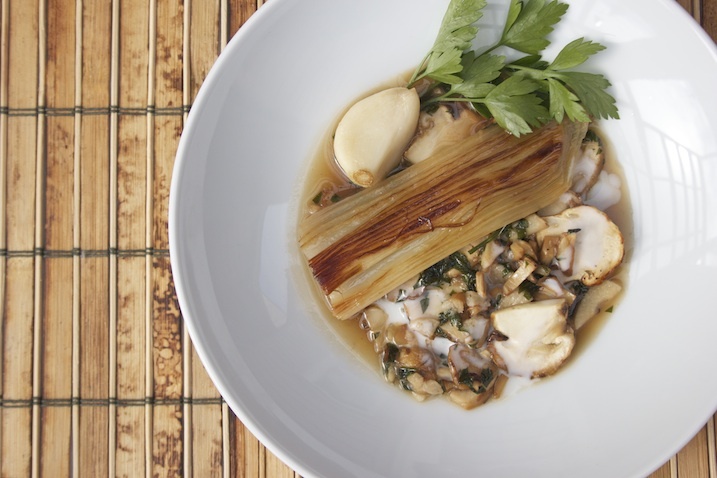 Matsutake mushrooms made it home with me and I paired them with leeks for lunch. If you buy some, choose firm mushrooms with caps that are still closed around the gills. They will look like little clubs. 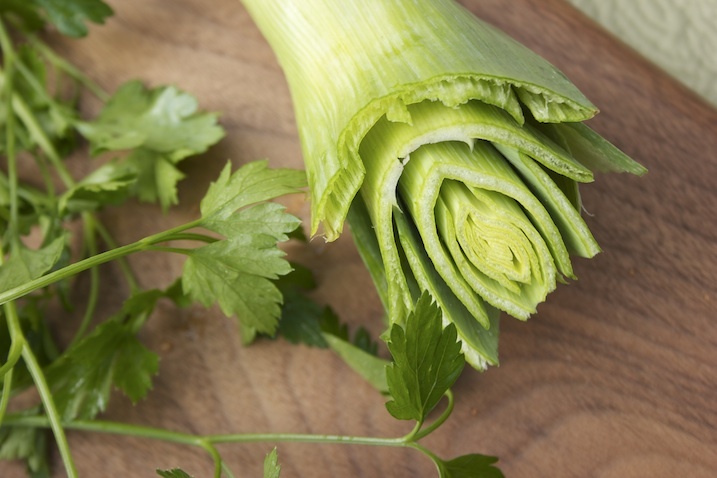 Slice leek in half lengthwise and clean out the grit under running water. Pat dry and cut the halves into four-inch lengths. Heat oils in a cast iron skillet over medium heat. Lay leek pieces, cut side down, in the pan and cook until golden brown. Flip pieces gently and repeat. 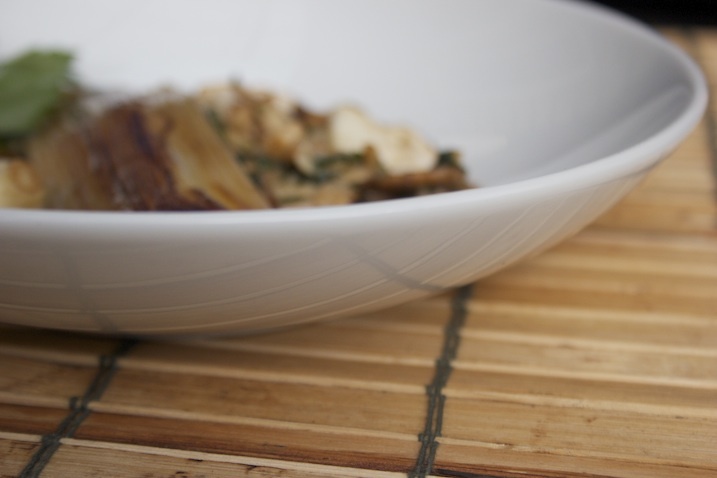 Pour two cups of water into the pan and add the kombu and garlic cloves. Bring water to a boil, cover, and transfer the pan to the oven. Cook for 10-15 minutes, or until leeks are soft. Slice the top parts of the matsutakes into thin slices. Cut the bottom portions into smaller pieces. Heat a large skillet over medium-high and add dry mushrooms. Allow to brown slightly then toss or turn using a spatula. When the mushrooms are brown, sprinkle with one or two good pinches of Kosher salt and toss or flip to distribute the salt evenly. The mushrooms will give up some liquid. Once this has evaporated, push mushrooms to the side and add oil to the empty side of the pan. Add garlic and sauté in oil for 30 seconds or until fragrant. Toss or stir to combine. Deglaze the pan with the rice cooking wine. Once it has evaporated, add 2 cups of water to the pan. Bring to a boil, cover, and reduce the heat. Simmer, testing periodically to see if the mushrooms are tender. 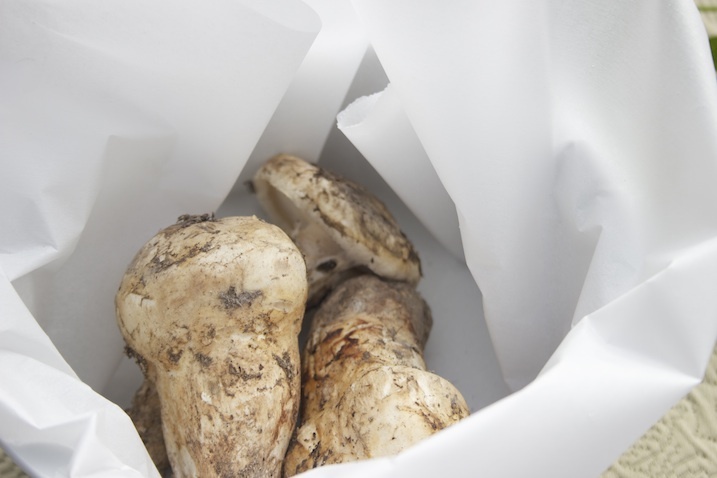 Matsutakes ae very firm so they won’t soften, per se. You should consider them done when you’re able to bite through a slice without your teeth bouncing back. Add parsley and stir. Cover and steam it along for another two or three minutes. Taste and adjust the seasonings. Ladle broth into shallow bowls and place a leek or two on top, cut sides up. Drizzle with coconut milk, if desired. 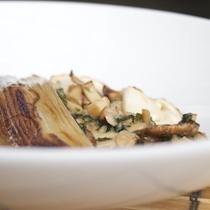 This entry was posted in Fall Vegetables, Mushrooms and tagged Garlic, Leek, Local, Matsutake, Organic, Parsley, Salt. Bookmark the permalink. “This is what keeps me coming back. One success” – I know that feeling!! Lovely photos! And I am banning tomatoes from my garden next year. Too much failure!! 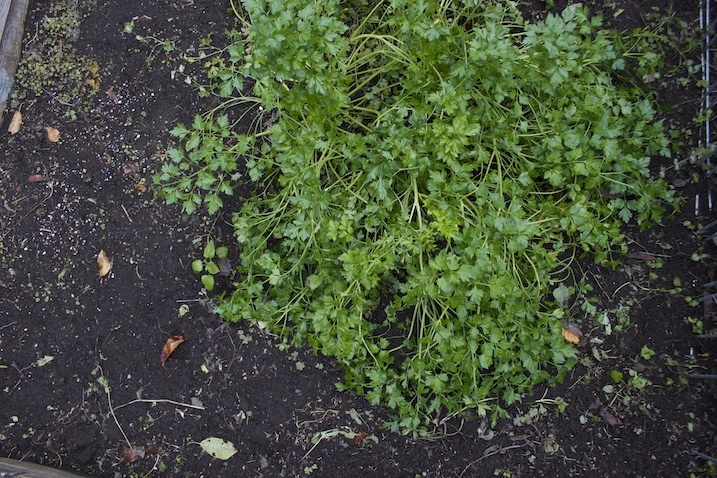 But yay for the parsley…every year! I can relate exactly to somehow losing track of the garden in the middle of the season, and then stumbling across unexpected bounty late in the year. It’s all part of the magic.